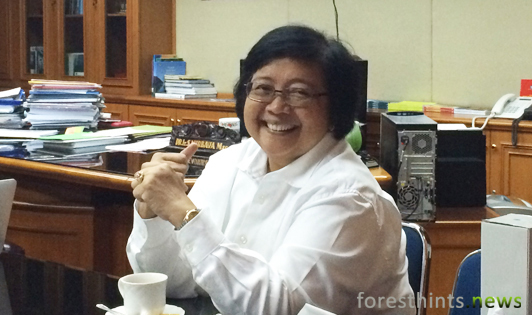 JAKARTA (foresthints.news) - Dr Siti Nurbaya, Indonesia's Environment and Forestry Minister, has confirmed that as a follow-up to the directive of President Joko Widodo, the entire process for new palm oil permits under her authority has been ended. Indonesia's Environment and Forestry Minister has the authority to release convertible production forests located in state forest areas for development purposes outside the forestry sector, such as for palm oil plantations. �I have put a stop to the entire process for new permits for palm oil expansion under my authority, from A to Z. This is concrete proof that we are following up on President Joko Widodo�s directive,� the minister told foresthints.news on Thursday (Apr 28). As to existing palm oil permits outside of state forest areas, the minister explained that discussions were ongoing regarding the steps that need to be taken for reviewing these permits, bearing in mind that any reviews must be conducted with the relevant ministries and local governments, in particular in the case of concessions which retain good forest cover. The minister gave the example of millions of hectares of state forest in the provinces of Papua and West Papua, which 'qualifies' as convertible production forest and which falls outside of the existing moratorium map, and thus could be legally released for development purposes, including for palm oil. �We are applying the moratorium on new palm oil permits in those millions of hectares even though the area falls outside of the existing moratorium map. I have already given the order to stop issuing new permits for palm oil in convertible production forests. The authority for this rests with me,� the minister asserted. She pointed out that the President was extremely concerned about palm oil expansion which involves opening up forests with intact forest cover on a massive scale, as is especially the case on the island of Papua, the majority of which is home to intact forests. As such, the whole issue needs to be reviewed at the national level, while a moratorium needs to be imposed on palm oil expansion throughout Indonesia. The minister also said that a presidential regulation is being prepared to form the legal basis for the palm oil and mining expansion moratorium. �The President has asked me to prepare the legal basis for the moratorium, which demonstrates how serious he is about the issue. Now we are in the process of drafting a presidential regulation as a legal back up to the President�s directive to the palm oil and mining expansion moratorium,� the minister explained. The minister expressed shock and amazement at the notion that the visit of Leonardo DiCaprio was the principle reason for the imposition of the moratorium on palm oil and mining expansion in the Leuser Ecosystem. She went on to vehemently deny the allegation that the moratorium decision had anything to do with pressure resulting from DiCaprio's trip to the Leuser Ecosystem. �What role did DiCaprio play in deciding on the palm oil and mining moratorium? Absolutely none. Was the moratorium imposed just because he visited Leuser for a few hours? Or because he signed a petition for the protection of the Leuser Ecosystem? Or because his foundation donated money to a few NGOs working for the conservation of the Leuser Ecosystem?� asked the minister, before stating that none of these things had played any part in her thinking. �On the contrary, it was me who guaranteed that DiCaprio would not be deported if he came back to Indonesia to support community development and conservation efforts, such as those in the Leuser Ecosystem. And, of course, I invited him to participate in joint efforts. These were my only concerns with respect to DiCaprio,� the minister continued. She stressed that those bold enough to make the claim that DiCaprio�s visit was taken into consideration when deciding on the Leuser palm oil and mining moratorium clearly have no understanding of the government level decision-making process and their claim is absolutely baseless. The minister proceeded to outline how the moratorium on palm oil and mining expansion in the Leuser Ecosystem involved discussions with the Governor of Aceh and Wali Nanggroe Aceh (Guardian of Aceh) which sought to enact the President�s directive. The minister concluded the interview with foresthints.news by making an appeal for all stakeholders - whether local, national or international - with concerns about the protection of the Leuser Ecosystem to undertake even stronger joint efforts, both with the Aceh government as well as her ministry, to support and reinforce the protection of the Leuser Ecosystem in the long term, something which has begun with the imposition of the moratorium on palm oil and mining expansion in the area.